Nancy Nicholson. Portrait photo by Jennie Ritchie. Ceramics by Nancy Nicholson. Photo by Jennie Ritchie. Pottery by Nancy Nicholson. Photo by Jennie Ritchie. 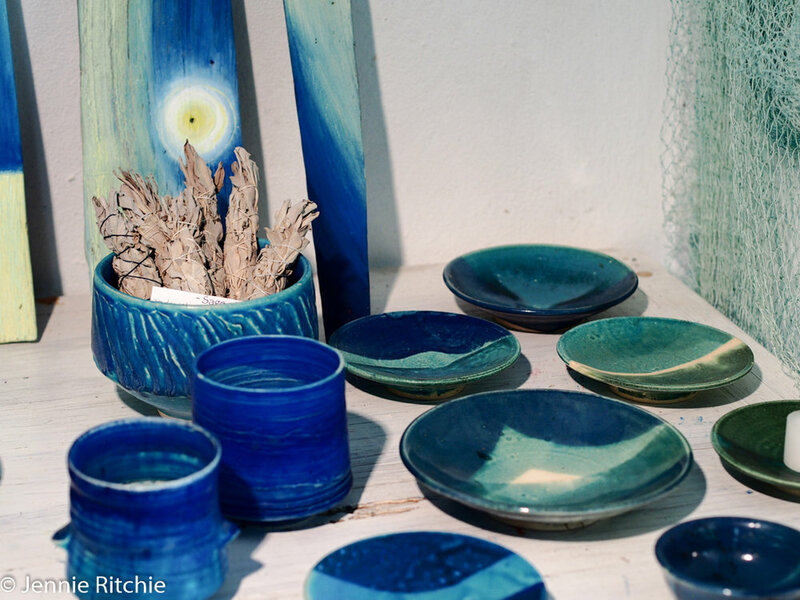 Signature blue pottery by Nancy Nicholson in Antigua. Her ceramics studio sits at the top of the hill overlooking English Harbour. A gentle breeze cools as it blows through the open doors. I am surrounded by the blues of the ocean and the blues of the pottery, each design unique and handmade by Nancy Nicholson. It is a joy to be invited here. Inspired by her surroundings, Nancy Nicholson is a creative potter and designer working from her home studio in Pigeon Point, Antigua. Locally sourced clay, traditional arawak designs and her vivid blue glaze have been the signature of this fabulously talented lady, but she also works on modern designs, sculpture, batiks and oil paintings. HRH the Princess Michael of Kent is just one of the lucky owners of a Nancy Nicholson design. Nancy sells her pieces and the art of others in her carefully curated gallery, the 'Rhythm of Blue'. "Yacht stewardesses collect tiles for the someday that they will leave the boats and settle down in a house" she says smiling, a knowing smile of someone who is rooted at her home that three generations of Nicholson's have built from the ground up. Her grandparents from Dublin and Cork were pioneers of a lost generation. They sailed out of Ireland in the 40s in search of a new life accompanied by Amber the cat. "I have strong ancestral connections with my Granny, Lisa Nicholson" says Nancy, "She was eccentric and creative". "Mill Reef was being established then, with an exclusive clientele. Granny got very involved with the Antiguan locals and employing them. She started something that my parents then continued. They started the charter yacht scene in Antigua and were the heartbeat of the harbour for many years". She describes her American mother as another pioneer, "She moved out of New York and lived in Antigua without electricity for years". She is incredibly proud of her family, "My father ran the chandlers and my uncle ran the charter yacht business. My father was also a self-taught archaeologist. He created both of the current museums in Antigua, in the dockyard and in St. John's". It was her father that inspired her early love of pottery. "I remember him finding a tile and putting this artefact in my hand". Nancy says that her development of the ceramics studio came from her "stubborn and slightly rebellious nature. I didn't want to conform or to work for anybody else". Now, however, it is a "dance of conforming and having the freedom to make what I want". Making a living out of ceramics involves making what the customers want and inspiring the customers to want what she has on offer. Strong-willed and creative, Nancy strikes me as someone who has lived and lost and survived stronger. She collects her own clay locally and processes it at her studio. Her kiln stands adjacent to her wheel and she moulds the clay for her pottery designs looking over one of the most spectacular views in Antigua. Nancy has three children. Her two sons are sailors and her daughter works for the environment. Pigeon Point is their wonderful home base in Antigua where Mum Nancy rules! 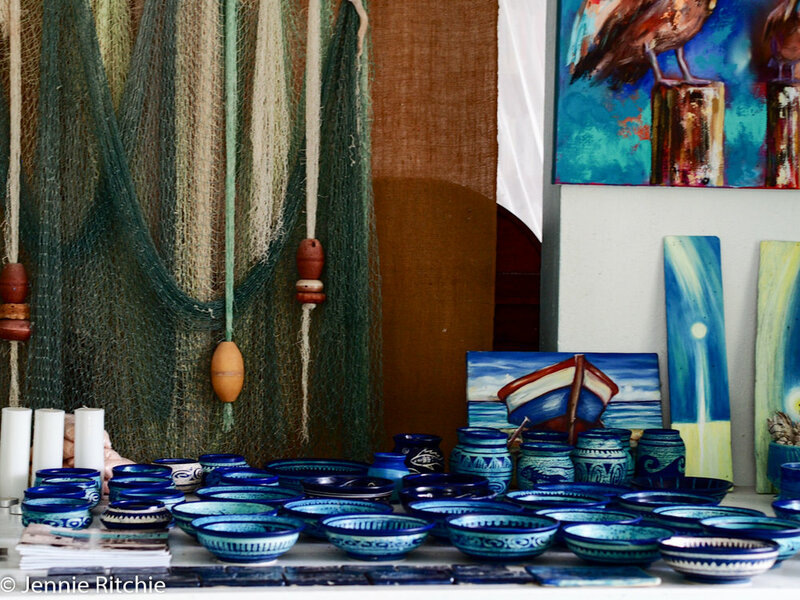 She has had her iconic shop 'Rhythm of Blue' in English Harbour for ten years. She says that "it is possible to make a living here, there is not that much competition". Does she enjoy what she does? "I like to work on my own, it is an integral part of my creativity. I just love doing what I do". Moving forwards she is branching out into the healing arts and plant medicine. Visit her newly expanded shop in English Harbour to discover the gorgeous creativity that is Nancy Nicholson or contact her via her website here. HOME TOUR - Nancy Nicholson ceramicist and potter shows us her gorgeous Caribbean home.